Justin Drew Bieber born March 14, 1994 is a Canadian pop/R&B singer. He began his professional career on YouTube, where he was discovered by his future manager, Scooter Braun. Braun flew Bieber to Atlanta, Georgia to consult withUsher and soon signed a record deal with Island. 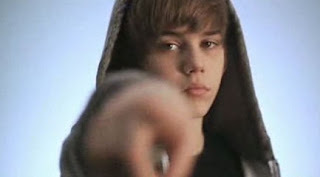 The first part of his two-part debut album My World was released on November 17, 2009.Four successful pre-album singles have been released: "One Time", "One Less Lonely Girl", "Love Me", and "Favorite Girl", which were Top 15 hits on the Canadian Hot 100 and Top 40 hits on the Billboard Hot 100. This accomplishment made Bieber the only artist in Billboard history to have four singles from a debut album chart in the Top 40 of the Hot 100 before the album's release. The album received positive reviews from critics, and debuted at #6 on the U.S.Billboard 200, selling 137,000 copies in its first week, which was the best opening release for a new artist in 2009. It also debuted at #1 on the Canadian Albums Chart. Part II of My World is currently set for a March 2010. Posted by Daniela Trujillo at 7:09 p.m.
Tify Andrade December 16, 2009 at 8:12 p.m. UNLIKE! JUSTIN BAIBER IS A BAD SINGER AND HE'S NOT GOD LOOKING!